How do you describe Barry Hoban? Forthright, determined, talented; he’s all of those, but above all he’s tough. Knock him down and he gets right back up. “I’m resilient,” he agrees. “One of my strengths, one of the reasons I had such a long career was because I had good health. I could eat anything, I was adaptable, self sufficient, and if you raced on the Continent in my day those things mattered. “They were more important than talent. Britain has always had talented bike riders, but until now they had to up sticks and live abroad. That meant adapting to Continental ways, eating different foods, learning new languages, giving up home comforts. “I’ll never forget the first time I had coffee in France. Back home in Yorkshire coffee was a milky drink, nothing like the bitter black stuff put in front of me, but I drank it and adapted,” he says. Hoban didn’t just adapt though, he was assimilated into European bike racing, an integral part of it. Barry Hoban started racing in the mid-Fifties with the Calder Clarion in Yorkshire. He loved his bike, and still loves to be outdoors and on his bike. Inevitably he was pulled into racing, and just as inevitably was pulled along the path of two other racers from the north. He went to the 1960 Olympics and was undoubtedly one of the fastest pursuiters in the world, but international titles didn’t come, and by 1961 Simpson had already won the Tour of Flanders. “It was time for me to go to France,” Hoban says. Hoban ripped through the amateur ranks, raced in the in-between category of independents and signed for Mercier-Hutchinson-BP, one of the biggest pro teams in France for 1964. “It doesn’t sound much now, but I signed for £20 a week, which in those days of contract limits in football was more than a Manchester United player earned,” he remembers. His first year was a cracker. Two stage wins in the Vuelta a Espana, held late April and early May, saw him pitched into the Tour de France, where he eagerly took up a role he was to regret. “Riding two Grand Tours is a lot for a first-year pro, plus we all did a full year, February until October. As a former pursuiter I could ride hard, and my team leader, Raymond Poulidor pushed as close as he ever got to Jacques Anquetil in the 1964 Tour. I got through a lot of work for him, and I tried to win stages for myself. I was everywhere and it was too much,” he says. His experience was a huge contrast to what would happen in a ProTour team today. “If you rode well you kept getting selected for races. They even made me ride Bordeaux-Paris, 550 kilometres in one day. And the equipment was poor, especially in our team. If we wanted light time trial wheels and silk tyres we had to buy them ourselves. Even then you couldn’t always use them. I was second in the big sprinter’s stage to Bordeaux in 1964 because our team manager, Anton Magne wouldn’t let me use my light wheels. Hell, he wouldn’t even buy jerseys with a zip at the front because they cost one franc more,” Hoban says. Hoban was ill and had bad luck for much of 1965, and only got going towards the end of the year. Just in time to play a part in one of the greatest days of British cycling. “I was very proud when Tom Simpson won his world title in San Sebastian,” Hoban says. Simpson was world champion, but Hoban was ambitious, and Simpson knew it. “By 1965 Tom was on the inside on the Continent, one of the top men along with Anquetil, Poulidor, Altig, Gimondi and a couple of others. It was a closed shop, and Tom certainly didn’t want me in it. In fact I’m uncomfortable when we are described as friends. We weren’t friends. We knew each other. I respected him and he respected me, but as rivals. Tom actually went out of his way to keep me in my place, even paying rivals to chase me down. “I remember slowing down after the finish of a race once and asking Tom why he’d chased me. He said, “Because I’m the number one British rider on the Continent, not you, and don’t you forget it.” Tom was a Hell of a bike rider though,” Hoban says, and the way he says it says more. Nevertheless, Hoban improved. He won the Grand Prix of Frankfurt in 1966, and gained some good placings, but then Simpson died during the 1967 Tour de France. Hoban could write a book about that. Hoban later married Simpson’s widow, Helen, and brought up his children, Jane and Joanne. Because of that he also tried to include Simpson’s family in his life, something that wasn’t always easy, but that Hoban tried is significant. Instead of a rival, Simpson was now a ghost in Hoban’s life. Hoban’s sprint changed in 1967. “Before then I tried to come from behind, use wheels, but I lost Paris-Tours by a tyre’s width to Rik Van Looy because of that tactic and swore never to sprint like that again. I never based my sprint on anyone else and always tried to get the jump and go from the front after that,” he says. Anyone who still thinks of Hoban as a sprinter should look at his second Tour de France stage win. It was in 1968, and he did it by dominating over the Col des Aravis and Colombière to win alone at Cordon, at the end of a steep climb from Sallanches and under the snowy peak of Mont Blanc. Hoban was the first British rider to win a Tour mountains stage, and only Robert Millar has done so since. “I was sixth in the points and in the King of the Mountains that year too,” he points out. The end of the Sixties and the mid-Seventies was Hoban’s time. He scored the first British Tour stage double in 1969, when he also finished third in Liège-Bastogne-Liège. And he won two more Tour stages in 1973, one in 1974 and his last in 1975 to bring the Hoban total to eight. Hoban finished third in the 1972 Paris-Roubaix, on a day when his legs were special. “I went through the Arenberg Forest with the leaders, then I punctured. I had to wait two and a half minutes for a team-mate to give me a wheel, and it was buckled. I closed the gap and got away again with eight good riders, but my wheel was on the verge of collapse. “I had to stop, but as I did, Roger De Vlaeminck attacked. I lost another minute waiting for a wheel but I chased the group down again, and I caught them just as André Dierickx attacked to take second behind De Vlaeminck. I got my breath back and went again with about five kilometres to go. I closed on them but I couldn’t catch them,” Hoban shakes his head and his voice trails off. Then he sparks back to life. “Ifs and buts don’t win races, that was one of Tom’s favourite sayings, but De Vlaemimck has never beaten me in a sprint, so if I hadn’t punctured, well?” he asks defiantly. 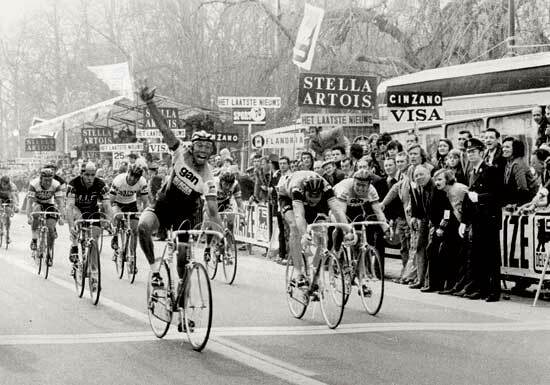 Hoban’s biggest win came in 1974, when he finally got his Classic; Ghent-Wevelgem. To do so he beat Eddy Merckx and Roger De Vlaeminck in a sprint finish. “OK, it’s not one of the Monuments, and I would have loved to have won one of those, but in those days Ghent-Wevelgem was 250 kilometres long, real Classic length, and we did 44kmph average. Hoban retired from racing in 1980, when he was 40. He applied to become British Cycling’s national coach, but they wouldn’t have him, which was a big mistake. He’s inspirational, passionate and would have been a great motivator. Instead he moved from Belgium to mid-Wales to run a bike factory and has worked in the bike industry since. But the enduring image Barry Hoban leaves on cycling is him tearing down a finishing straight, elbows out, wheels on fire and that huge melon-slice grin as he throws his bike across the line for another victory. “My high was definitely Ghent-Wevelgem. It’s a Flemish race, second only to the Tour of Flanders – I lived in Ghent in Flanders and I loved racing there. I liked the whole ethos of Flemish racing, the Flemish riders are tough racers for tough races.” This is Barry Hoban’s pick of his racing career high point. Then, typically, his low point is a metaphor for his own unbreakable attitude. “The end of 1971: I left Mercier at the end of 1969 and did two years with Sonolor-Lejeune. I signed for another year, 1972, then went to ride the Montreal six-day where, like all the other riders, I had the name of a local sponsor on my kit. “But when I returned home I got a registered letter saying my contract with Sonolor was terminated for carrying adverse advertising. Sonolor had Lucian Aimar in Montreal, but nothing happened to him. “Anyway, I was high and dry. All the teams were full and I was staring at retirement at the age of 31, but I didn’t want to stop. My agent advised me to try Louis Caput, the new manager of Mercier, but he had no money. “Then all of a sudden Caput called, he’d signed up Gan as a sponsor, so the Gan-Mercier team was born, I was in and I went on to have the best period of my career with my best team. For a while we were unstoppable,” he told us.